Papel picado banners are a common sight in Mexican celebrations. The beautiful patterns on the banners are created through an ancient Mexican art form that is still popular today. Check out the banners in this Cinco de Mayo worksheet. 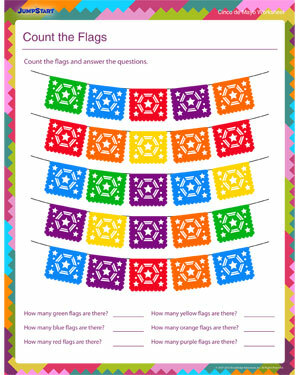 Kindergarteners must count the flags on each banner and answer the questions at the end of the worksheet. This printable worksheet is great for practicing counting and color recognition.